Myopia is a significant, prevalent disease in children with increasing rates of progression. With over 80 million reported myopic children world wide there are considerable socioeconomical and public health concerns. More over, High myopia is associated with potentially blinding complications such as glaucoma, retinal detachment, and myopic macular degeneration. A substantial amount of research has been done to determine the etiology of myopia, the risk factors associated with myopia, techniques to prevent myopia and ways to treat myopia. 1.5 Syndromes with associated myopia are listed below. Figure 1: Human myopic eye, showing the cornea and lens bending (refracting) incoming light rays so they focus in front of the retina . Myopia (nearsightedness) is an ocular disorder in which the optical power of the eye is too strong for the corresponding axial length. Light rays from an object at infinity entering a non-accommodating myopic eye are converged too strongly and focus in front of the retina.The far point of a myope is located in front of the eye, between the cornea and optical infinity. Visual acuity of an uncorrected myope will continue to decrease as objects are located further away from the far point and closer to optical infinity. Conversely, visual acuity is greater for objects located between the far point of the eye and the near point of accommodation. Myopia is generally classified into two groups: non-pathologic and pathologic myopia. Both groups have separate disease processes, clinical features, and prognoses. Non-pathological myopia is also commonly referred to as physiological, simple or school myopia. In non-pathologic myopia the refractive structures of the eye develop within normal limits, however the refractive power of the eye does not correlate with the axial length. The degree of non-pathologic myopia is usually minimal to moderate (< 6.00 diopters) and onset usually begins during childhood or adolescence. Myopic progression generally continues throughout the adolescent growth period and slows or becomes stable early in the second decade. Less commonly, a second myopic shift may occur late during the second decade or early in the third decade. Pathologic myopia is generally classified as a high myopic refractive error that is progressive and generally presents very early in childhood. Pathologic myopia is usually defined as spherical equivalent > 6.00 diopters or axial length >26.5mm. Patients with high axial myopia are at a greater risk of developing progressive retinal degeneration and other vision threatening pathology. See pathology section for more detail. Myopia is a complex disease with a multi-factorial etiology. It is well documented that pathological non-syndromic high myopia and associated syndromic high myopia show evidence of familial inheritance. Although non-syndromic high myopia is most commonly inherited in an automosomal dominant pattern, multiple chromosomal loci have been identified which suggests genetic heterogeneity. High myopia is also a symptom of several multi-system complex diseases. The genetic mutations for these syndromes have been identified and the subsequent structural defects of the eye are most commonly related to connective tissue and retina. This type of myopia is only a small proportion of the overall myopic population and to date, there is no known isolated gene associated with physiologic myopia. The prevalence of myopia varies greatly between different populations and ethnic groups. The prevalence rates of myopia in the United States have been reported as 20-50% and as high as 80-90% in some parts of Asia. The majority of the myopic population consists primarily of patients with non-pathologic myopia; approximately 66% of patients with myopia have less than 2 diopters (D) of myopia and 95% of myopic patients have less than 6 diopters. In 2003 a multi-center study the US reported significantly different prevalence rates among children of four different ethnic groups. The highest rates were found among Asian children with a prevalence of 18.5% and hispanic children with 13.2%. Lower prevalence rates were found in African American children with 6.6% followed by Caucasian children with a prevalence rate of 4.4%. A large epidemiological study in 2000 by Lin et al. showed that myopic prevalence rates for Taiwanese children were reaching 80%. It is reported that there are over 80 million myopic children world wide. In addition to physiologic, pathologic and syndromic myopia, other processes involving the refractive structures of the eye can also produce myopia. The power of the lens can be increased by osmotic changes (diabetes, galactosemia, uremia, sulfonamides), nuclear sclerotic cataracts, anterior lenticonus, and changes in lens position or shape (miotics, anterior lens dislocation, excessive accommodation). Changes to the cornea secondary to keratoconus, congenital glaucoma, and contact lens-induced corneal warpage can also cause myopia. Myopia can also be the result of increased axial length secondary to retinopathy of prematurity, posterior staphyloma, scleral buckle surgery and congenital glaucoma. Syndromes with associated myopia are listed below. There are distinct pathological signs that are associated with high myopia. Dilated fundus examination may reveal various pathological changes in the posterior pole including: myopic crescents, Fuch’s spots (pigmented, circular lesions secondary to subretinal neovascularization and hemorrhage), exudates, posterior staphyloma, retinal breaks, scarring and retinal detachment. The optic discs may appear flat or tilted. The vitreous may also be affected with opacification, liquification and detachment. Cataracts and open angle glaucoma are also risk factors of high myopia. The ocular pathology that is associated with high myopia is not generally observed with isolated physiologic myopia. In 2003, Luo et al. used optic coherence tomography (OCT) to study the association of macular volume and thickness with refraction and axial length. The study included 104 Chinese school children with refractions between +1.00 to -4.5 diopters. After controlling for gender and age, the authors found that increasing axial myopia was associated with reduced macular volume and parafoveal thickness. The authors suggested that OCT may be a useful tool for determining early macular changes in physiologic myopia. Many studies have investigated the heritability of parental myopia associated with physiological myopia. Numerous studies have shown a higher rate of myopia in children with myopic parents and an even higher risk for children with two myopic parents, . Many studies are confounded by strong environmental factors and research has shown that associated parental heritability could be the result of shared environments rather than shared genes. Moreover, investigators have also shown variation in the prevalence of myopia for individuals of the same racial or ethnic group in different geographic locations. In 2008 Rose et al. compared the prevalence and risk factors of myopia in children of Chinese ethnicity in both Sydney and Singapore with inclusion criteria that required both parents to have Chinese ethnicity. The prevalence of myopia in children of Chinese ethnicity was significantly higher in Singapore (29.1%) than in Sydney (3.3%). There is a general agreement that physiologic myopia has a multi-factorial etiology with both genetic and environmental influences. Environmental factors including near work, accommodation, accommodative lag, spectacle correction, intelligence scores, urbanization and diet have been investigated for their role in myopia and myopic progression. Many studies have reported a correlation between near work and increased myopia, however the association is usually weak and the data tends to be confounded by other genetic and environmental factors. A large study in 2008 by Ip et al. suggested a correlation between high intensity near work and increased rates of myopia. The authors showed a minimal correlation between hours spent engaged in continuous reading and parental reports of close reading distance with increased myopia. Time spent doing homework or time spent doing near activities did not show a correlation, in fact time spent playing hand held console games was associated with a more hyperopic refraction in crude analysis. This data suggests a link between near work and myopia but does not conclude a causative relationship. A number of studies have looked at computer use and myopia and found no significant correlation. Accommodation is a significant covariant of reading and near work and as a result, several studies have focused on the association between accommodation, accommodative lag and myopic progression. A study in 2004 by Gwiazda et al. demonstrated that children with higher degrees of myopia also had increased accommodative lag. The children enrolled in the study were already myopic and although a correlation between myopia and accommodative lag can be assumed, it does not represent a causative relationship. More recent studies have shown opposite results to those of Gwianda et al. In 2006 Mutti et al. showed no changes in accommodative lag prior to the onset of myopia, moreover accommodative lag was only documented in children after the onset of myopia. The authors speculate that accommodative lag may be a consequence rather than a cause of myopia and is unlikely a predictive factor. This was further supported in 2008 by Weizhong et al who showed no significant relationship between accommodative lag and myopic progression. There are numerous multi-cultural studies that have shown higher intelligence quotient (IQ) scores in children with myopia. Although the causal relationship has yet to be determined, it is hypothesized that ocular axial length is directly related to cerebral development. It has also been speculated that similar genes influence both IQ and myopia. Seang-Mei et al studied 1204 children in Singapore to determine the association between intelligence and myopia. After controlling for age, gender, parental myopia and education, and books read per week they showed that children with higher IQ scores had significantly more myopia than those with lower IQ scores. The authors suggest that non-verbal IQ may be an independent and stronger risk factor than increased reading (books per week). In 2008 a similar study was performed in the UK on 6871 children and after adjusting for ethnicity and parental myopia a strong correlation was shown between higher performance on school-based standardized tests, verbal IQ and risk of myopia. Evidence based research has shown a strong correlation between increased intelligence scores and risk of myopia but the reason for the association has yet to be determined. There are several studies that have reported urbanization as a potential determinant of physiologic myopia. Many studies that have shown an association between increased myopia in urban areas as compared to rural areas are confounded by variables such as level of education, IQ, socioeconomic status, near related activities and outdoor exposure. In 2008, a Polish study of 2206 students found that children living in the city had a two-fold increase in the rate of myopia when compared to children living in rural areas. Although they were able to show a correlation between urbanization and myopia, the authors did not control for the above mentioned co-variants and a causative relationship cannot be assumed. There is controversy in the literature as to whether ambient light while sleeping is a risk factor for developing myopia in young children. In 1999, a study published in Nature by Quinn et al. investigated the affects of ambient lighting on refractive development in 479 young children. Parents of children admitted to a pediatric ophthalmology clinic were given questionnaires on the child’s night time light exposure. The authors found an association between night-light exposure during the first two years of life and the development of physiologic and high myopia. They reported a dose-dependant risk showing an even higher prevalence of myopia in children who slept with room lights on before the age of two. This article has been the subject of debate and with many researchers questioning the validity of their findings. A similar study in 2003 was performed in the UK where parents of 122 university students answered questions on their child’s artificial light exposure during the first two years of life. The study controlled for a number of variables including parental myopia and showed no significant association between nighttime light exposure and myopia. Conversely, they found myopia was more common in children who slept in darkness during infancy, although the data was not statistically significant. There is currently no consensus on whether ambient nighttime lighting during early childhood is a true risk factor for myopic development. Although several studies have investigated the effect of diet and nutrition as environmental determinants of myopia and myopic progression, there are significant inconsistencies in the results. A recent study in 2010 by Lim et al. evaluated the association between myopia, axial length and dietary factors of 851 Chinese children using food frequency questionnaires. After the authors controlled for age gender, body mass index, socioeconomic status, parental education, time spent outdoors and books read per week they found that higher saturated fat and cholesterol were correlated with longer axial lengths. They did not find a significant association between myopic refractive error and any other nutrients analyzed. Children with physiologic myopia commonly present with complaints of blurred distance vision. Parents may also notice their child squint their eyes while viewing distance objects. If the degree of myopia is moderate or high then children may be observed sitting closer to the television and computer or holding reading material closer. Pathologic changes related to high myopia are discussed in the pathology section. The most common symptom of myopia is decreased distance vision. Patients with pathologic myopia may also report visual distortion secondary to retinal pathology. Myopia can be detected in children by various vision screening procedures at the pediatrician’s office or at school. A significant refractive error is suspected when visual acuity is reduced during a routine eye exam or vision screening. Although vision screening techniques such as photo-screening and auto-refraction can detect myopia, the prescription can only be accurately quantified using manifest or cycloplegic refraction. See clinical diagnosis. Myopia is most accurately quantified using manifest or cycloplegic refraction. Cycloplegic refraction is the gold standard for diagnosing any refractive error in a child. Children generally over-accommodate during manifest and auto-refractions, causing their refractive error to appear more myopic. Cycloplegic refraction is therefore necessary to determine the most accurate prescription and to avoid over-minusing children. The pathology that can be associated with pathologic high myopia is diagnosed with a dilated fundus exam. Figure 2: Retinoscopy. A hand-held instrument (retinoscope) projects a beam of light into the eye. The ophthalmologist neutralizes the movement of the reflected light with lenses to determine the patient’s refractive error . The standard treatment for myopia in children is glasses. 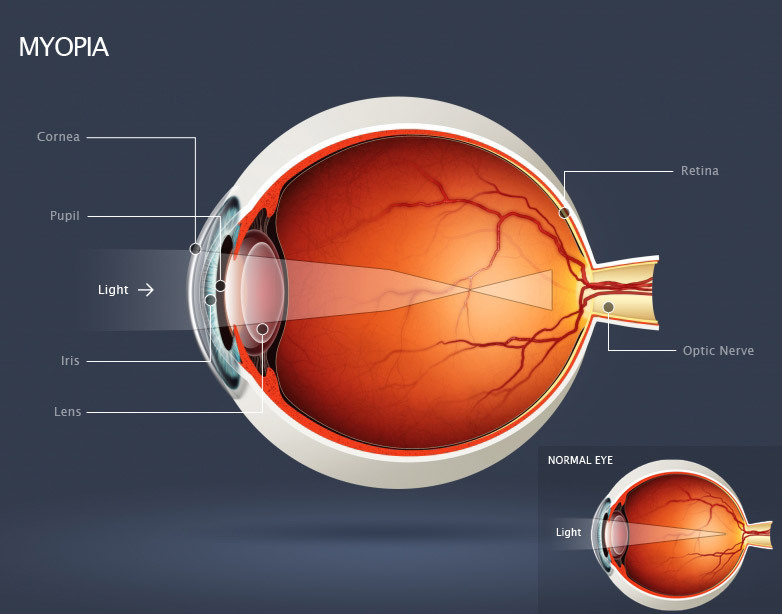 A concave lens is used to diverge the light rays entering the eye and place the focal point on the retina. Figure 3: Light rays exiting a concave lens have less positive vergence, placing the focal point on the retina. Once children have matured enough to handle the responsibility, then contact lenses may be an option. Most ophthalmologists agree that patients should be in their pre-teen or early teenage years before considering contact lenses; however the decision is made for each patient based on their level of maturity. In special circumstances, refractive surgery may be indicated for children with neurological impairment, neurobehavioural issues, facial deformities (craniofacial, hemifacial microsomia, ear deformity) or severe anisometropia that render it impossible for glasses wear. Although contact lenses are usually the secondary treatment option for children with developmental anomalies, there are concerns for infection, mishandling, and expense. Refractive surgery for the general population is usually only indicated once the patient has stopped growing which generally occurs in the late teens to early twenties. Keratorefractive surgery uses lasers to re-shape the cornea and attempts to produce an emmetropic eye. If the surgery is successful then the patient will have excellent visual acuity without glasses or contact lenses. Photorefractive keratectomy (PRK), laser in situ kertomileusis (LASIK) and laser epithelial keratomileusis are the most commonly performed refractive surgeries. Intraocular refractive surgeries are becoming more commonplace. Various therapeutic modalities have been implemented for the treatment of myopic progression. The efficacy and safety of several of these treatment methods have not yet been determined. Currently there are no general guidelines for preventing myopia and the use of non-medically proven treatments remains controversial. Studies have shown that intensive near work may be a contributing factor for myopia and myopic progression. Many authors have speculated that accommodating during near work may be contributing to the progression and development of myopia. Both refractive and pharmocological methods of eliminating accommodative demands while participating in near work have been investigated. Many studies have investigated the effect of decreasing accommodation in myopic patients using single vision, bifocal and multifocal lenses. In 2003, the Correction of Myopia Evaluation Trial (COMET) studied the effects of progressive additional lenses (PVLs) and single vision lenses (SVLs) in 469 myopic children. Their preliminary data showed a slowing of myopic progression by a statistically small amount during the first year of PVLs when compared to SVLs. The authors concluded that it did not warrant a change in clinical practice. There is significant debate over the efficacy and long term outcome of bifocals for the prevention of myopic progression. A recent study in 2010 by Cheng et al. studied the effects of bifocals and prismatic bifocal spectacles on myopic progression in Chinese Canadian children. The authors showed a greater reduction of myopic progression and axial elongation at two years for children in bifocals and prismatic bifocals as compared to the SVLs group. Unfortunately, the study did not provide long-term follow-up data. Accommodation can be inhibited by using an eyedrop that contains a muscarinic receptor antagonist. Atropine and pirenzepine have been the focus of studies investigating pharmocologic prevention of myopic progression. Although previous studies have reported decreased myopic progression rates with atropine eyedrops, ophthalmologists have been reluctant to initiate treatment due to poor follow-up data, risk of atropine toxicity and symptoms of photophobia. A study in 2009 by Tong et al. published a placebo-controlled, randomized, double-masked follow-up study to evaluate the effect of myopia progression after cessation of atropine therapy. The authors found a reduction in myopic progression after 2 years of atropine therapy when compared to the placebo group, however during the follow-up year the atropine group had significantly higher progression rates. Due to the significant rebound of myopia after cessation of treatment and the previously mentioned risks, many clinicians do not advocate using cycloplegic eyedrops for treating myopic progression. Pirenzepine is another muscarinic receptor antagonist, and unlike atropine it is relatively selective for the M1 receptor and less likely to cause cycloplegia and mydriasis. Two similar studies invested the efficacy of Pirenzepine using multicenter, double-masked, placebo-controlled treatment trials. A 50% reduction in myopic progression was shown in patients that used 2% pirenzepine gel in 2005 by Tan et al. and again in 2008 by Siatkowski et al.. Both studies showed an excellent safety profile with significantly less side effects than seen with atropine. Currently there are no long term follow-up data on pirenzepine. A highly controversial treatment modality for retarding myopic progression is the use of overnight rigid contact lenses (orthokeratology). These lenses temporarily change the refractive state of the eye by applying pressure to the cornea, creating a non-physiological shape. There are currently no large studies that have shown a benefit to overnight rigid contact lenses. There are several studies that suggest temporary benefits of orthokeratology, however due to small sample size and no long term follow up data, these studies remain inconclusive. In 2003 Katz et al. performed a large randomized trial of 298 Singaporean children that showed that myopic progression was not reduced with overnight contact lens wear and the authors concluded that there is no apparent benefit to orthokeratology for the treatment of myopic progression. There are potential sight-threatening and devastating risks associated with overnight contact lens wear and numerous reports of corneal infection and scarring have been published. The positive effect of outdoor activity for reducing myopic progression has been documented in numerous studies. Physical activity, sports, and low accommodative demands have been postulated as the cause of this protective effect. The Sydney Myopia Study in 2008 demonstrated a significant reduction in the prevalence of myopia in children who spent more time outdoors. After adjusting for time spent on near work, parental refractive error and ethnicity, they showed that increased time spent outdoors, rather than physical activity was associated with less myopia. The authors of the article suggest that light intensity when outdoors may be the contributing factor, by increasing depth of field and decreasing image blur. They also comment on the possible effects of light on the release of dopamine from the retina which is an eye growth inhibitor. Although the nature of this protective factor has yet to be determined, outdoor activity does appear to have positive effects for slowing myopic progression. Patients with early onset and high myopia have a worse prognosis for long term visual acuity. These patients tend to have a higher rate of myopic progression with longer axial lengths. Patients with longer axial lengths are at a greater risk for developing myopic retinal degeneration and other associated pathology. During the late 70’s animal models of myopia were developed in monkeys, chicks and tree shrews. Form deprivation by frosted occluders was found to produce axial elongation and myopia in the occluded eye. Ten years later, the model was expanded to include myopia produced by negative lenses (and hyperopia produced by positive lenses) applied to the eyes of 7 day-old chicks . The models have been extended to a variety of mammals (see reference  for review). It is generally accepted that the mechanism leading to changes in ocular elongation involves local retinal image processing which sends a “stop” or “go” message to the sclera, regulating scleral matrix properties and its rate of elongation. Somehow the growth mechanisms are sensitive to where the principal image plane is falling. If the principal image plane falls behind the retina, the eye tends to grow more, and vice versa, when the image plane lies in front of the retina, the choroid thickens and the eye stops growing. Most studies on animals have been carried out during a period that would be equivalent to the first year or two of life in humans. In that period, non treated congenital ptosis, corneal scars and non-treated dense congenital cataracts often produce axial myopia in humans similarly as form deprivation develops in animal models. The signalling cascade from the retina to the sclera is still under study. Amacrine cells have been implicated in retinal processing of the signal. The choroid and the sclera show biochemical changes associated with ocular growth in the animal models. Two drugs which have potential to prevent myopic progression in children, atropine and pirenzepine, appear to block axial elongation in some of the animal models by pathways which do not involve accommodation, perhaps by acting directly on the retina  or the sclera. By the 90’s, the link found between education and myopia development in epidemiological studies, was generally explained by the possible regulation of the rate of axial elongation by defocus during reading. In other words, the lag of accommodation present in humans while reading, places the image plane behind the retina and it was suggested that this hyperopic defocus could induce axial elongation in humans, as it does in animal models  . Bifocals and progressive addition lenses applied to myopic children showed some ability to slow myopic progression, consistent with this idea, although the effects were generally not strong, and it was not clear why some subjects developed myopia while others did not if all children lag to some extent while reading. Evidence on whether accommodative lag precedes or is a consequence of myopia is conflicting. More recent experimental data showed that children  or adults with myopia had relative peripheral hyperopic defocus (images in the peripheral retina fell behind the retinal plane in optically corrected myopic subjects) so it was postulated that the peripheral refractive error could drive the emmetropization mechanisms leading to changes in ocular growth patterns. More recent evidence suggests that the difference in eye shape may be a consequence, rather than a cause of myopia. In 2002 it was shown, in the chick model, that the stop signal produced by positive lenses was more robust than the grow signal of negative lenses. One hour of clear distance vision or exposure to positive lenses for short periods (i.e. images in front of the retina), cancelled the myopia produced in chicks by whole day of frosted ocludders or negative lens wear. Experiments in monkeys with foveal ablation and lenses or occluders with central holes that allowed for clear central vision showed that defocus in the peripheral retina could significantly affect axial growth of the eye. This suggests that even if peripheral hyperopic defocus is not a cause of myopia, if images in the periphery are placed in front of the retina (myopic defocus), the stop signal could decrease axial elongation in human eyes. Spectacles and contact lenses with peripheral plus add are being tested in humans and there has been success in decreasing myopia progression in selected cases. More research is needed in this area before this technology is available. Contributing Authors: Rafael Iribarren MD, Ian Morgan PhD. Founded in 1985, EyeCare America is a public service program of the Foundation of the American Academy of Ophthalmology. The EyeSmart™ public awareness campaign empowers Americans to take charge of their eye health. EyeSmart emphasizes the need for Americans to know their risk factors for eye diseases, infections and injuries, and the role ophthalmologists play in the prevention, diagnosis, and treatment of eye conditions. The National Eye Institute site, produced in conjunction with the U.S. National Institutes of Health, is devoted specifically to eye care. Includes a patient information library, photos and illustrations, low-vision information, news and events, clinical studies and current research, and patient information in Spanish. Contains roughly 10 eye care-related topics from the American Academy of Family Physicians. Turbert D, Pagan-Duran B. Myopia. American Academy of Ophthalmology. EyeSmart® Eye health. https://www.aao.org/eye-health/diseases/myopia-list. Accessed March 19, 2019. American Academy of Ophthalmology. Core Ophthalmic Knowledge: Myopia Practicing Ophthalmologists Learning System, 2017 - 2019 San Francisco: American Academy of Ophthalmology, 2017. ↑ American Academy of Ophthalmology. Basic and clinical science course. Optics, refraction and contact lenses. Section 3. San Francisco: American Academy of Ophthalmology, 2003. ↑ 4.0 4.1 4.2 Friedman NJ, Kaiser PK. Essentials of Ophthalmology. Philadelphia, PA: Elsevier Inc; 2007:253-254. ↑ Wright KW, Spiegal P. Pediatric Ophthalmology and Strabismus. New York, NY: Springer;2003: 644-653. ↑ 6.0 6.1 6.2 6.3 Morgan I, Rose K. How genetic is school myopia? Progress in Retinal and Eye Research 2005;24:1-38. ↑ Kleinstein RN, Jones LA, Hullett S, et al. Refractive Error and Ethnicity in Children. Arch Ophthalmol. 2003;121:1141-1147. ↑ Lin LL, Shih YF, Hsiao CK, et al. Prevalence of myopia in Taiwanese schoolchildren: 1983-2000. Ann Acad Med Singapore. 2004;33(1):27-33. ↑ 10.0 10.1 Siatkowski RM, Cotter SA, et al. Two-year multicenter, double-masked, placebo-controlled, parallel safety and efficacy study of 2% pirenzepine ophthalmic gel in children with myopia. Ophthalmology 2008;12:332-339. ↑ Luo HD, Gazzard G, Fong A, et al. Myopia, axial length and OCT characteristics of the macula in Singaporean children. Invest Ophthalmol Vis Sci. 2006;47(7):2773-2781. ↑ Konstantopoulos A, Yadegarfar G, Elgohary M. Near work, education, family history and myopia in Greek conscripts. Eye 2008;22:542-546. ↑ Rose KA, Morgan IG, et al. Myopia, lifestyle, and schooling in students of Chinese ethnicity in Singapore and Sydney. Arch Ophthalmol. 2008;126(4):527-530. ↑ Mutti DO, Zadnik K. Is computer a risk factor for myopia? J Am Optom Assoc. 1996;67:521-530. ↑ 16.0 16.1 Gwiazda JE, Hyman L, et al. Accommodation and related risk factors associated with myopia progression and their interaction with treatment in COMET children. Invest Ophthalmol Vis Sci 2004;45:2143-2151. ↑ 17.0 17.1 Mutti D, Mitchell GL, Hayes JR, et al. Accommodative lag before and after the onset of myopia. Invest Ophthalmol Vis Sci 2006;47:837-846. ↑ Weizhong L, Zhikuan Y, et al. A longitudinal study on the relationship between myopia development and near accommodation lag in myopic children. Ophthal Physiol Opt 2008;28:57-61. ↑ Seang-Mei Saw, Say-Beng Tan, Daniel Fung, et al. IQ and the Association with Myopia in Children. Invest Ophthalmol Vis Sci 2004;45:2943 – 2948. ↑ Williams C, Miller LL, Gazzard G. A comparison of measures of reading and intelligence as risk factors for the development of myopia in a UK cohort of children. Br J Ophthalmol 2008;92:1117-1121. ↑ Czepita D, Mojsa A, Zejmo M. Prevalence of myopia and hyperopia among urban and rural schoolchildren in Poland. Ann Acad Med Stetin. 2008;54(1):17-21. ↑ GE, Shin CH, Maguire MG, et al. Myopia and ambient lighting at night. Nature 1999;399(6732):113-114. ↑ Guggenheim JA, Hill C, Yam TF. Myopia, genetics and ambient lighting at night in a UK sample. Br J Ophthalmol 2003;87(5):580-582. ↑ Lim LS, Gazzard G, Lo YL, et al. Dietary factors, myopia, and axial dimensions in children. Ophthalmology. 2010;117:993-997. ↑ American Association of Pediatric Ophthalmology. Refractive errors. http://www.aapos.org/faq_list/refractive_errors . [May 2010]. ↑ Gwiazda J, Hyman L, Hussein M, et al . A randomized clinical trial of progressive addition lenses verses single vision lenses on the progression of myopia in children. Invest Ophthalmol Vis Sci. 2003;44(4):1492-1500. ↑ Cheng D, Schmid KL, et al. Randomized trial of effect of bifocal and prismatic bifocal spectacles on myopic progression two year results. Arch Ophthalmol. 2010;128:12-19. ↑ Tong L, Huang XL, Koh AL, et al. Atropine for the treatment of childhood myopia: effect on myopia progression after cessation of atropine. Ophthalmology 2009;116(3):572-579. ↑ Tan DTH, Lam DS, Chua WH et al. One-year multicenter, double-masked, placebo-controlled, parallel safety and efficacy study of 2% pirenzepine ophthalmic gel in children with myopia. Ophthalmology 2005;112(1):84-91. ↑ Katz J, Schein OD, Levy B et al. A randomized trial of rigid gas permeable contact lenses to reduce progression of children’s myopia. Am J Ophthalmol. 2003;136(1):82-90. ↑ Rose KR, Morgan IG, Ip j, et al. Outdoor activity reduces the prevalence of myopia in children. Ophthalmology. 2008;115(8):1279-1285. ↑ Wiesel TN, Raviola E. Myopia and eye enlargement after neonatal lid fusion in Monkeys. Nature 1977;266:66-8. ↑ Wallman J, Turkel J, Trachtman J. Extreme myopia produced by modest change in early visual experience. Science. 1978;201:1249-51. ↑ Sherman SM, Norton TT, Casagrande VA. Myopia in the lid-sutured tree shrew (Tupaia glis). Brain Res 1977;124:154-7. ↑ Schaeffel F, Glasser A, Howland HC. Accommodation, refractive error and eye growth in chickens. Vision Res 1988;28:639-57. ↑ Schaeffel F, Troilo D, Wallman J, Howland HC. Developing eyes that lack accommodation grow to compensate for imposed defocus. Vis Neurosci 1990;4:177-83. ↑ Wallman J, Winawer J. Homeostasis of eye growth and the question of myopia. Neuron 2004;43:447-68. ↑ Fischer AJ, McGuire JJ, Schaeffel F, Stell WK. Light- and focus-dependent expression of the transcription factor ZENK in the chick retina. Nat. Neurosci 1999;2:706–712. ↑ Nickla DL, Wallman J. The multifunctional choroid. Prog Retin Eye Res 2010;29:144-68. ↑ Rada JA, Shelton S, Norton TT. The sclera and myopia. Exp Eye Res 2006;82:185-200. ↑ McBrien NA, Moghaddam HO, Reeder AP. Atropine reduces experimental myopia and eye enlargement via a nonaccommodative mechanism. Invest Ophthalmol Vis Sci 1993;34:205-15. ↑ Schwahn HN, Kaymak H, Schaeffel F. Effects of atropine on refractive development, dopamine release, and slow retinal potentials in the chick. Vis Neurosci 2000;17:165-76. ↑ Lind GJ, Chew SJ, Marzani D, Wallman J. Muscarinic acetylcholine receptor antagonists inhibit chick scleral chondrocytes. Invest Ophthalmol Vis Sci 1998;39:2217-31. ↑ Gwiazda J, Thorn F, Bauer J, Held R. Myopic children show insufficient accommodative response to blur. Invest Ophthalmol Vis Sci 1993;34:690-4. ↑ Duke-Elder S, Abrams D. Clinical methods of estimating the refraction. In: Duke-Elder S, Abrams D. System of Ophthalmology Vol. V, Ophthalmic optics and refraction. London: Henry Kimpton, 1970;474-6. ↑ Schaeffel F, Weiss S, Seidel J. How good is the match between the plane of the text and the plane of focus during reading? Ophthalmic Physiol Opt 1999;19:180-92. ↑ Mutti DO, Sholtz RI, Friedman NE, Zadnik K. Peripheral refraction and ocular shape in children. Invest Ophthalmol Vis Sci 2000;41:1022-30. ↑ 49.0 49.1 Seidemann A, Schaeffel F, Guirao A, Lopez-Gil N, Artal P. Peripheral refractive errors in myopic, emmetropic, and hyperopic young subjects. J Opt Soc Am A Opt Image Sci Vis 2002;19:2363-73. ↑ Winawer J, Wallman J. Temporal constraints on lens compensation in chicks. Vis Res 2002;42:2651-68. ↑ Smith EL 3rd, Kee CS, Ramamirtham R, Qiao-Grider Y, Hung LF. Peripheral vision can influence eye growth and refractive development in infant monkeys. Invest Ophthalmol Vis Sci 2005;46:3965-72. ↑ Smith EL 3rd, Ramamirtham R, Qiao-Grider Y, Hung LF, Huang J, Kee CS, Coats D, Paysse E. Effects of foveal ablation on emmetropization and form-deprivation myopia. Invest Ophthalmol Vis Sci 2007;48:3914-22. ↑ Sankaridurg PR, Donovan L, Varnas S, Chen X, Lin Z, Fisher S, Ho A, Ge J, Smith E III, Holden BA. Progression of Myopia With Spectacle Lenses Designed to Reduce Relative Peripheral Hyperopia: 12 Months Results. IOVS 2010 ARVO E-Abstract 2206. ↑ Holden BA, Sankaridurg PR, Lazon de la Jara P, Smith E III, Chen X, Kwan J, Martinez A, Ho A, Ge J. The Vision CRC Myopia Control Study Group. Reduction in the Rate of Progress of Myopia With a Contact Lens Designed to Reduce Relative Peripheral Hyperopia. IOVS 2010 ARVO E-Abstract 2220. This page was last modified on March 19, 2019, at 16:02. This page has been accessed 245,553 times.